TEMPERATURE CONTROLLER - often called a PID controller is an instrument used to control temperature. The temperature controller takes an input from a temperature sensor and has an output that is connected to a control element such as a heater or fan. *Mounting : 2 Polycarbonated flush mounted clamps for panel mounting. *Accuracy :+/-0.5% of full scale +/- 1Digit. In order to fulfill the ever-evolving demands of our esteemed clients, we are engaged in providing an optimum quality array of Temperature Controller. We offer a wide range of Mold Temperature Controller. 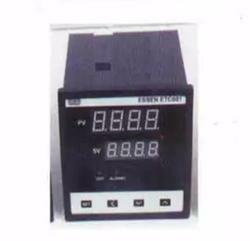 These Mold Temperature Controller are fabricated as per international quality standards, our entire range of Mold Temperature Controller is demanded for easy installation, low noise level, less power consumption and several more attributes. The FMC-10 has been designed to operate in the full range of environments from commercial premises through to heavy industrial applications which may require hazardous area sensing. Shivam Electronics is a Delhi based importer, distributor and stockist of industrial automation products. Subzero controllers are designed with the smallest Customer in mind. They are very simple to use and have step-by-step functions to prevent the equipment from malfunctioning.